"No . . . no, I'm definitely not famous. What's your name?" "Marin. What TV shows and movies are you in?" It's impossible to miss the challenge in Marin's voice. At a parent-teacher meeting a few weeks ago, I handed out brochures advertising the Shakespeare Club, my after-school program. The pamphlet included a brief biography mentioning my career as an actor and my work as a dialogue and acting coach. There was no mention of time spent as a public school teacher because I am not, nor have I ever been, one. "It's true, Marin, I was an actor for a long time in the theatre and in a few movies and television shows, but I stopped doing that a while ago. Actually, before you were even born." An annoying bead of sweat trickles down the inside of my arm. I clutch my elbow close, hoping the wetness doesn’t show. Marin's hair is pulled tight into braids. She tilts her head, chews the inside of her cheek, and keeps me in her eyeline. "What TV shows were you in?" "Yeah, I would. What ones?" God, give it up! I want to scream, but you shouldn't scream at children. That's never a good idea, and certainly not at the very first meeting. I release a long sigh. "What a terrific story, funny and brave! Shakespeare gives his actors a glimpse into their humanity, teaches them patience, and fosters their courage. Mel Ryane does the same for her wayward students, and they return the favor. Bravissima!" "Teaching Will sings with honesty, adventure, humility and humor. Only someone who loves Shakespeare would dare to do what Ms. Ryane did and dare to write about it. The book is a joy." "I was completely caught up in Mel Ryane's story of a theatre artist who discovers a metaphor for her life's journey while teaching third-, fourth-, and fifth-graders the joy of theatre and storytelling through the words of William Shakespeare. I absolutely loved it!" "Hilarious, tender, and instructive, Mel Ryane's very personal story of teaching a cast of eight-year-olds that they can be Shakespearean actors is as moving and delightful a performance as any on a stage. She deserves our standing ovation." "It was truly magical. 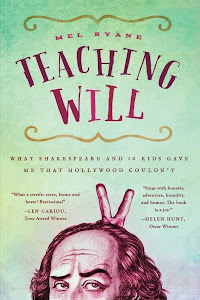 Mel Ryane humorously and poignantly reveals her dance with illusion, delusion, and reality while chronicling her journey to open the world of Shakespeare to grade-schoolers. I laughed out loud. Then I cried." "Inspiring, funny, touching, and rewarding. The book is a great read for actors, teachers, parents, and young adults. Mel Ryane's insights are a lesson on how receptive kids can be when they have a new world opened up to them." "All Mel Ryane’s strutting and fretting signifies a great deal to the budding thespians in her charge. A beautifully calibrated memoir told with great heart and humor. Brava!"